So each month, I pay £1950 into that pot. First of all, my online statements keeps saying that the term of the mortgage is 29years and few months, this goes down a month each month even if I double the amount I repay. If I repay for that amount of time (and even the 950 minimum) surely I'll end up paying more that I should !? 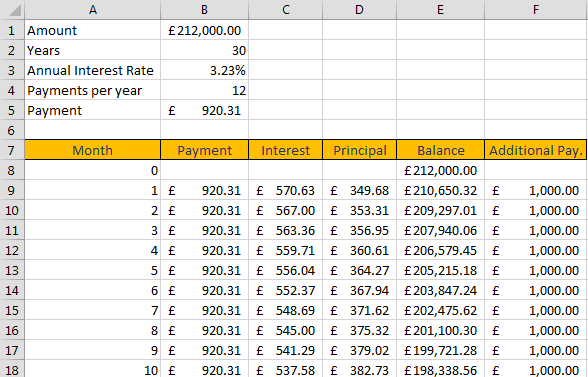 My main question is : What is the formula to calculate the cost of skipping a £1000 payment on a given month ? You refer to your monthly "online statements". Does these have an entry for "outstanding balance" or something similar. Does it go down by slightly more than 1000 each month when you make both a regular and extra payment? You owe a certain amount of money at the start of the month. It grows at the stated interest rate throughout the month, reaching a new balance owed by the end of the month. Then you throw some money in, reducing the balance owed, and the whole process continues, month by month. If you throw in more each month than that months growth, then eventually you'll pay off the whole thing. The danger is that the mortgage company is regarding the extra payments as an early payment and is just holding them (at no interest to you)to make the regular monthly payments on schedule. You really need to be sure that the reduction in balance owed each month reflects the extra payment. The online statements that show the next payments and balances; most banks don't revise this. This is a static statement generated once in 2 years and keeps getting shown notionally as if you are making normal payments. So don't pay to much attention to this. You are right that the number of years should decrease faster. You would get a yearly statements, just make sure all your payments are reflected in it. You could do this in Excel. Run this for your years and you should be able to see how the interest reduces over period. M = 895, so 950 is a bit above that - either implying the rate is higher by a bit than you say, or there are some fees (maybe taxes?) or something else in there. Then, at any point, you can determine the "cost" of not paying an extra 1000 pounds off by entering the details in there - make sure to fix the right number of payments remaining. Then look at the difference. The difference in the "total amount owed", minus 1000 pounds, is the amount it would cost you to skip one extra payment. That's because what you're effectively doing is, right now, reducing the total principal. Of course, if you're skipping that payment somewhere down the line, the cost will be less - as there's less time for that amount to generate interest - but it should give you an idea. You can also determine an approximate answer by looking at your mortgage closing documents. Assuming the UK works roughly like the US, one thing your lender ought to tell you (in writing) is the total cost of borrowing. I.E., what the total amount of money you'll pay after 30 years. Since you may not have a fixed-rate mortgage like we do in the US, it may be approximate, but the concept should still be there. In your case, you're going to pay a bit over 320k pounds over 30 years at that interest rate. (A bargain!) Divide 320k by 206k, and you get a ratio of 1.56. Each pound you borrow costs 1.56 pounds over the life of the loan - so reducing that amount by 1000 pounds would reduce your total cost for the life of the loan by 1560 or so (1562.80 by my reckoning). Now, every additional 1000 pounds you pay off reduces your cost by a bit less than the first one (the first one is 1000 pounds you'd have had for 30 years, but the second one is 1000 pounds for 29.8 or so years, the third by 29.5 years or so, etc. ); there's a diminishing return. But you can always recalculate the "if I had started the mortgage now" amount, and calculate it with/without the extra 1000 pounds, and know the difference of that particular skipped payment. For example, let's say you pay 1895 per month (I am assuming my model here, assuming the extra 55 are going to taxes or something non-mortgage related), and two years in want to skip a payment. Plugging things in, each payment of 1000 pounds is saving 520 extra pounds over the life of the mortage (rather than 560 pounds as at day 1). You'll see the amount stay more or less stable for 10 years or so, then start to drop more quickly as the principal starts dropping more rapidly after around ten years (since its not linear, but exponential). All of this assumes that you're accurately describing how the 1000 pounds is applied - to the principal. Not all localities automatically do that; I'm not in the UK so I don't know their law, but it used to be common in many places that "Extra" payments were assumed to be making an early payment of the next month, and so wouldn't be applied until then - not saving you any interest. That's slowly going away as more places realize that's very consumer unfriendly, even though it sounds "nice", so hopefully it is not true in your case: but verify with your lender that what you think should be happening with the money is. Some mortgages don't allow overpayments, and your extra 1000 would simply be applied to future due monthly payments. If this is the case, you would be now 'months ahead' in paying, but didn't save a single penny on interest. This form of mortgage is the standard in Germany, and mostly unknown in the US (most people in the US find the concept even outrageous). I don't know which form is possible/used in the UK, but you need to verify this for your loan. I think a simple amortization table would help you. The above answers (in my opinion) don't show you a direct correlation between the affect of payment and interest on it's reduction of the balance (or principle). I changed the symbols to pounds. i.e - I'm from the U.S. and am treating the problem as such. The first image calculates your payments (naturally you're actually paying more for the sake of convenience) and subtracts the interest. The "principal" that is left is the reduction to the balance. Your assumption that a prepayment of 1,000 is a direct reduction to the balance is correct. Note, as you continue to pay, the interest amount is reduced perpetually reducing the balance more quickly in later years. 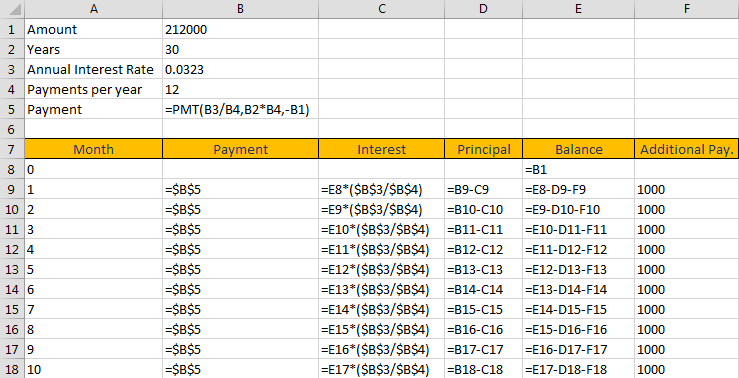 If you follow the formulas and replicate this in an Excel sheet, you can find how long it will take you to repay the loan. Make sure to correct the amount and years as mine were an estimate of the original figure. If there is anything I am leaving out, or would like me to explain, feel free to comment. Not the answer you're looking for? Browse other questions tagged united-kingdom mortgage interest-rate repayment or ask your own question.